There are four parts of a cooling/refrigeration system and all air conditioners essentially go through the cycle of compression, condensation, expansion, and evaporation in a closed circuit. The compression phase involves a compressor device which makes use of an electric motor to compress the refrigerant coolent. Today hermetically sealed reciprocating compressor is widely used for the refrigeration and air conditioning applications. This type of compressor can use a drive to control the compressor motor speed to modulate cooling capacity. A Variable Frequency Drive (VFD) is a type of motor controller that drives an electric motor by varying the frequency and voltage supplied to the electric motor. Other names for a VFD are variable speed drive, adjustable speed drive, adjustable frequency drive, AC drive, microdrive, and popularly here in this application called as an Inverter. Since Inverter is a device which converts Direct Current (DC) input into Alternating Current (AC) output, it is referred to as DC Inverter (to remove any ambiguity because a DC-DC converter is commonly confused with DC-AC Inverter). A DC Inverter Air Conditioner has a compressor which is VFD or Inverter controlled (as descibed above) and the whole package is commonly called as Inverter Air Conditioner or DC Inverter Air Conditioner. So, the basic operating principle of an Inverter is pretty straightforward as it is comparable to the technology used in cars, where you need to press the throttle harder to go faster. Compressor speed (as an analogy say the engine running and its pistons creating the torque) effects the performance output (speed of the car). The Frequency (throttle controlled by VFD) is directly related to the motor’s RPM’s and hence cooling or heating performance (car’s speed). In other words, the faster the frequency, the faster the RPMs go. If an application does not require an electric motor to run at full speed, the VFD can be used to ramp down the frequency and voltage to meet the requirements of the electric motor’s load. As the application’s motor speed requirements change, the VFD can simply turn up or down the motor speed to meet the speed requirement. In a more convenient and technical way, Solar Ac is an Air Conditioner described as using “Inverter technology” or “Inverter equipped” has the ability to continuously control its thermal transfer rate by modifying the compressor’s speed in response to the demand for cooling . Variable Refrigerant Flow (VRF) phenomena is typically adopted with an Inverter equipped Air Conditioner which adds a VFD and Control Circuitry alongside the compressor in order to support variable motor speed and thus variable refrigerant flow helps regulate the conditioned-space temperature. By contrast, traditional air conditioners regulate temperature by utilizing a compressor that is periodically either working at maximum capacity or switched off entirely. Fixed speed compressors start or stop automatically in order to sustain the desired temperature, but an inverter unit regulates regulates the capacity of the compressor instead. Frequent on/off switching of the compressor means high initial torques for the compressor to start running and hence more surge of currents during transient times, hence increase in electricity bills. Note that the four-part heat exchange cycle is divided at the center into a high side and a low side. The same refrigerant is used to move the heat from one area, to cool this area, and to expel this heat in another area. Gases give off heat when changed from gas to liquid. The refrigerant comes into the compressor as a low-pressure gas, it is compressed and then moves out of the compressor as a high-pressure gas. The gas then flows to the condenser. Here the gas condenses to a liquid, and gives off its heat to the outside air. The liquid then moves to the expansion valve under high pressure. This valve restricts the flow of the fluid, and lowers its pressure as it leaves the expansion valve. The low-pressure liquid then moves to the evaporator, where heat from the inside air is absorbed and changes it from a liquid to a gas. A microcontroller can sample each ambient air temperature and adjust accordingly the speed of the compressor. The alternating current is used to drive an induction motor since the speed of an induction motor is proportional to the frequency of the AC, the compressor can now run at different speeds with the use of VFD the same phenomina that makes 12v Solar Fridge Price in Pakistan fairly competitive to Inverter Fridge. The inverter air conditioning units have increased efficiency in contraction to traditional air conditioners, extended life of their parts and the sharp fluctuations in the load are eliminated. This makes the Inverter AC units quieter, with lower operating cost and with less broke downs. The Inverter AC units might be more expensive than the constant speed air conditioners, but this is balanced by lower energy bills. The payback time is approximately two years depending on the usage. The additional electronics and system hardware adds cost to the equipment installation but can result in substantial savings in operating costs. Eliminating stop-start cycles increases efficiency. Generally, VFDs allow you to match the speed of the motor-driven equipment to the load requirement. Electric motor systems are responsible for more than 65% of the power consumption in industry today. Optimizing motor control systems by installing or upgrading to VFDs can reduce energy consumption in your facility by as much as 70%. Additionally, the utilization of VFDs improves product quality, and reduces production costs. Combining energy efficiency tax incentives, and utility rebates, returns on investment for VFD installations can be as little as 6 months. By operating at varying speeds, VRF units work only at the needed rate allowing for substantial energy savings at partial-load conditions. Heat recovery VRF technology allows individual indoor units to heat or cool as required, while the compressor load benefits from the internal heat recovery. Energy savings of up to 55% are predicted over comparable unitary equipment. This also results in greater control of the building’s interior temperature by the building’s occupants. The fixed speed compressor in a standard air conditioner runs at 100% capacity when it is started, but an inverter unit starts at a low level and then progressively enhances its capacity, depending on the requirement to heat up the room or cool it down. DC inverter air conditioners make use of a variable frequency drive to regulate the motor’s speed, thereby controlling the speed of compressor too. Frequency acts as the the input variable to control the compressor speed. The current ambient air temperature is sampled by using a microcontroller and the compressor’s speed is adjusted appropriately. Pulse Width Modulation is a technique to control power applications, since analog systems such as linear power supplies undergo large heat dissipation (Energy Loss) and digital signals represented in case of PWM are fairly easy to convert back to analog with a minimum of hardware. Variable Frequency Drive includes a rectifier that converts the incoming Alternating Current (AC) to Direct Current (DC). It then utilizes Pulse Width Modulation (PWM) of the DC in the inverter to generate AC of desired frequency. Capacity modulation is a way to match cooling capacity to cooling demand to application requirements. Are You in Search for Best Ac Brand in Pakistan? Look no more! Q. Is there anything such as solar panel air conditioner or small solar air conditioner? A. A true solar powered air conditioner is based on Lithium Bromide chamber working with the princples of heat exchange in effect. 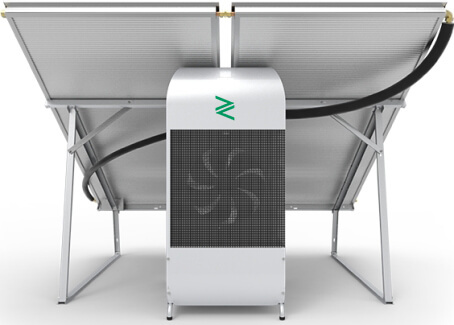 In such a scenario, the solar energy air conditioner is a simplistic absorption chiller (truly portable dc air conditioner does not exist) which looks similar to the following image and the only portable solar powered air conditioner. There is no substitute to this technology and considering 0.5 ton inverter ac price in Pakistan is just silly. Scientists at Zorays Solar have researched an environmentally friendly cooling technology that does not harm the ozone layer. This thermal air conditioning is achieved by using solar energy and therefore reducing the use of greenhouse gases. Q. What is the market offering in the name of solar air conditioner for home? A. Quite frankly, solar powered room air conditioner which Pakistani Solar Companies (including Zorays Solar) are offering are nothing more than solar split system air conditioner converted on its own dedicated Solar Energy System harnessing solar power for air conditioner. Looking for a hybrid air conditioner price is futile owning to poor after-sales. Q. Oh so can I just buy a solar powered split air conditioner and that is it? solar inverter for air conditioner (to run a VFD device). Read all the myths about solar dc air conditioner and thank us later. solar batteries (if you are getting GEL/AGM/OpZV batteries – in name of dry batteries you are doomed). solar panels. They all look the same from the naked eye. Here is a guide on how to select each solar panel for air conditioner. That sums up air conditioner with solar panel price. Q. How many solar panels needed to run an air conditioner? A. Going all out to find best solar ac in Pakistan? The inverter should at least be overdesigned +60 per cent the rated power of the dc solar air conditioner to accomodate for the surge (for the beggining torque given to the dc compressor for air conditioner) and 40 per cent to expansion on top to accomodate for dust/raining or cloudy days. There is not much need to run air conditioning in cloudy oir rainy days. Q. Why choose Zorays Solar for your solar inverter air conditioner? A. 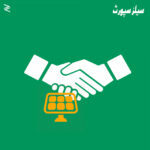 It is a competitive market, and turning an air conditioner on solar power is no big deal. But selecting the right components optimized at the right price is mastery. We are the only solution providers who have patented suntracked solar power poles that let the client remain hassle free thinking about its performance. We have in fact made it into a small solar air conditioner system which occupies least space on your roof top or any other facility. To discover a case study, experiments were run in June 2015 to find out that if such a solar air conditioner is ran all day long; the overall bill of a a 10-marla home is 1500 rupee only. Q. What happens to the performance of my solar system in rainy days? 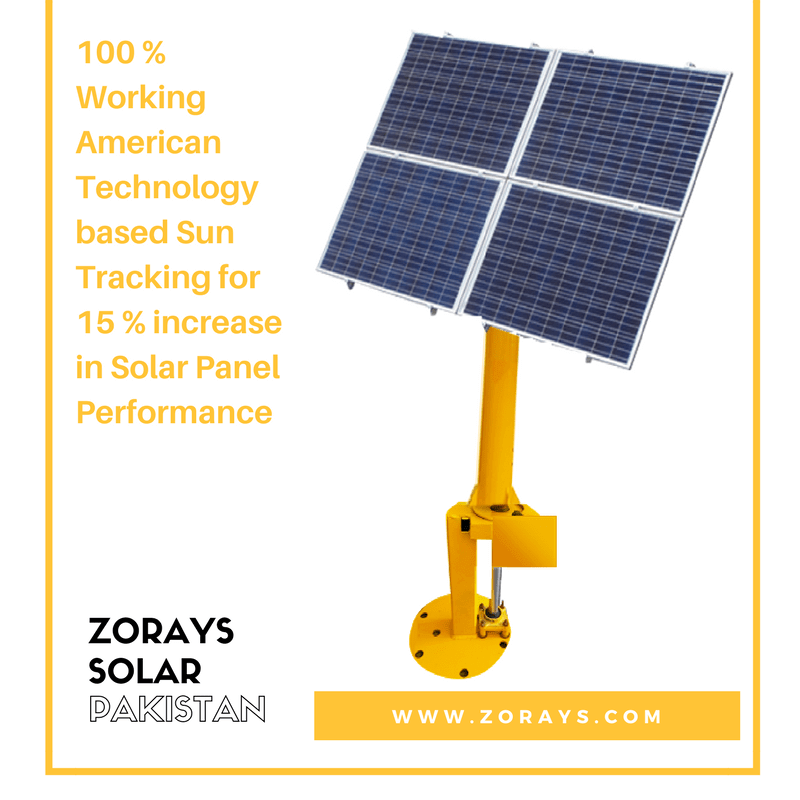 Luckily, with our Sun tracked Solar Poles we enhance the performance of each panel and correspondingly the upfront cost of additional panels is reduced vs. the fixed mounted offered solution availaible in the solar air conditioner in Pakistan market. Q. Is it a 48v dc air conditioner? A. As seen from the picture buying a 48v dc air conditioner is futile and adds to the cost since it is expensive. A usual inverter based AC suffices to serve as solar ac room air conditioner. Since same amount of panels to be installed either way; we recommend you to replace your conventional split AC with a 1 tonne inverter AC of your choice from the given brands. Looking for 48 V DC Solar, 30 V/230 V Hybrid Solar System? Contact Now: 03248163264 Minimum order quantity: 10 pcs. Q. Why 1 ton ac prices in Pakistan are useful to consider? A. The fixed speed compressor in a standard air conditioner runs at 100% capacity when it is started, but an inverter unit starts at a low level and then progressively enhances its capacity, depending on the requirement to heat up the room or cool it down. DC inverter air conditioners make use of a variable frequency drive to regulate the motor’s speed, thereby controlling the speed of compressor too. Frequency acts as the the input variable to control the compressor speed. The current ambient air temperature is sampled by using a microcontroller and the compressor’s speed is adjusted appropriately making 1 ton ac price in Pakistan the most desireable. Effectively, we would want the AC to never trip off and always to stay slow and steady and keep trying to win the race. A 1.5 tonner AC is equally probable; but the supplied system is more effective for the above reason. Q. What is the pay back time from solar system ac price? Searching for solar ac price in Pakistan 2019 instead? Click Here! for solar ac price in Pakistan.